Rani Perry with her AS Pirae teammates. 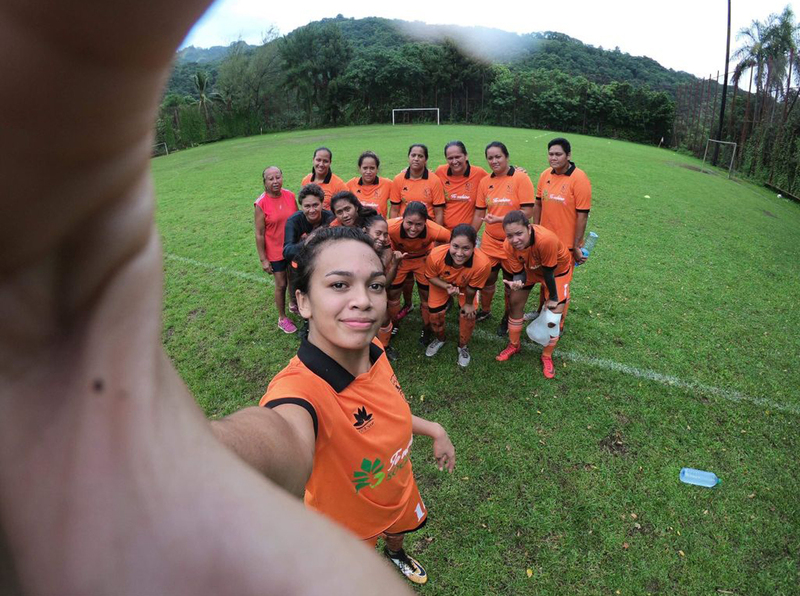 She’s only 20 years old but already Rani Perry is a key figure in the development of women’s football in Tahiti. An OFC and FTF referee, last November Perry announced the creation of her own football team to compete in the Senior Women’s Championship. That team, AS Pirae, is now at the top of the leaderboard after eight games and remains unbeaten having racked up 32 points with Tefana not far behind on 29, followed by Tamarii Punaruu on 26. The foundations of Perry’s football team are made up from her futsal side, proving this young women is as passionate about football, in all its forms, as can be. “I wanted to play under the name AS Pirae and no other, even if they’d asked me to play elsewhere,” Perry said of the origins of her team. “I was able to create this team thanks to the girls who I had already played with. I asked them if they wanted to play in my team and they all said yes. At only 20 years old, Perry is within the age bracket to be playing in the U-23 championship, but said she’s happy alongside the seniors. And with Pirae’s unbeaten record, it’s clearly a side capable of keeping pace. “The Championship is going well for us, we haven’t lost a match so far,” she said. “We have one catch-up match against Punaruu who had to postpone, but we’re not the only ones, we’ve all played eight matches. Creating a team from scratch hasn’t been an easy process and Perry has had to shoulder a lot of the work, but is enjoying every minute of it she sees it pay off in the results. “I do a bit of everything – coach, player, referee, captain, manager,” she said. On top of managing her team and playing as much football as she can, Perry also tries to fit in refereeing, which isn’t easy. “Football has been my passion since I was little, I never wanted to play any other sport than this. I love playing football,” she explained. “I got my Baccalaureate and now I devote myself 100 per cent to football. “In the beginning I never had the intention to go into refereeing, but my dad is a referee and I followed him into it, it’s been five years now. There’s certainly plenty to keep Perry occupied going forward and she said she wants to continue playing a role in every aspect of football she possibly can. “It’s obvious that for every girl, the objective is to play in the national team, for the pride of representing their island,” Perry said. “The objective for me right now is to win the championship, to hold on to first place. “Soon I’ll be taking part in the Festival des Iles with Hamuta Val who are 2017 runners-up, and I’ll also be refereeing the football. The Senior Women’s Championship will conclude in May, with six matches remaining on the calendar.